This specification defines APIs for console debugging facilities. This specification is an early work in progress that welcomes feedback to refine toward more precise and compatible definitions. It is also the editors' first specification, so please be kind and constructive. Please join us in the issue tracker for more discussion. For historical reasons, console is lowercased. It is important that console is always visible and usable to scripts, even if the developer console has not been opened or does not exist. For historical web-compatibility reasons, the namespace object for console must have as its [[Prototype]] an empty object, created as if by ObjectCreate(%ObjectPrototype%), instead of %ObjectPrototype%. If condition is true, return. Let message be a string without any formatting specifiers indicating generically an assertion failure (such as "Assertion failed"). If data is empty, append message to data. If Type(first) is not String, then prepend message to data. Let concat be the concatenation of message, U+003A (:), U+0020 SPACE, and first. Empty the appropriate group stack. Try to construct a table with the columns of the properties of tabularData (or use properties) and rows of tabularData and log it with a logLevel of "log". Fall back to just logging the argument if it can’t be parsed as tabular. TODO: This will need a good algorithm. Let trace be some implementation-specific, potentially-interactive representation of the callstack from where this method was called. Optionally, let formattedData be the result of Formatter(data), and incorporate formattedData as a label for trace. Perform Printer("trace", « trace »). The identifier of a function printed in a stack trace is implementation-dependant. It is also not guaranteed to be the same identifier that would be seen in new Error().stack. Perform Printer("dir", « object », options). Let finalList be a new list, initially empty. Let converted be a DOM tree representation of item if possible; otherwise let converted be item with optimally useful formatting applied. Each console namespace object has an associated count map, which is a map of strings to numbers, initially empty. Let map be the associated count map. If map[label] exists, set map[label] to map[label] + 1. Otherwise, set map[label] to 1. Let concat be the concatenation of label, U+003A (:), U+0020 SPACE, and ToString(map[label]). Perform Logger("count", « concat »). If map[label] exists, set map[label] to 0. Let message be a string without any formatting specifiers indicating generically that the given label does not have an associated count. A group is an implementation-specific, potentially-interactive view for output produced by calls to Printer, with one further level of indentation than its parent. Each console namespace object has an associated group stack, which is a stack, initially empty. Only the last group in a group stack will host output produced by calls to Printer. Let group be a new group. If data is not empty, let groupLabel be the result of Formatter(data). Otherwise, let groupLabel be an implementation-chosen label representing a group. Incorporate groupLabel as a label for group. Optionally, if the environment supports interactive groups, group should be expanded by default. Perform Printer("group", « group »). Push group onto the appropriate group stack. Optionally, if the environment supports interactive groups, group should be collapsed by default. Perform Printer("groupCollapsed", « group »). Pop the last group from the group stack. 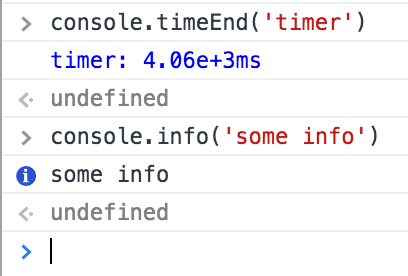 Each console namespace object has an associated timer table, which is a map of strings to times, initially empty. If the associated timer table contains an entry with key label, return, optionally reporting a warning to the console indicating that a timer with label label has already been started. Otherwise, set the value of the entry with key label in the associated timer table to the current time. Let timerTable be the associated timer table. Let duration be a string representing the difference between the current time and startTime, in an implementation-defined format. "4650", "4650.69 ms", "5 seconds", and "00:05" are all reasonable ways of displaying a 4650.69 ms duration. Let concat be the concatenation of label, U+003A (:), U+0020 SPACE, and duration. Perform Printer("timeEnd", « concat »). See whatwg/console#134 for plans to make timeEnd() and timeLog() formally report warnings to the console when a given label does not exist in the associated timer table. The logger operation accepts a log level and a list of other arguments. Its main output is the implementation-defined side effect of printing the result to the console. This specification describes how it processes format specifiers while doing so. If args is empty, return. Let rest be all elements following first in args. If rest is empty, perform Printer(logLevel, « first ») and return. If first does not contain any format specifiers, perform Printer(logLevel, args). It’s important that the printing occurs before returning from the algorithm. Many developer consoles print the result of the last operation entered into them. In such consoles, when a developer enters console.log("hello! "), this will first print "hello! ", then the undefined return value from the console.log call. The formatter operation tries to format the first argument provided, using the other arguments. It will try to format the input until no formatting specifiers are left in the first argument, or no more arguments are left. It returns a list of objects suitable for printing. Let target be the first element of args. Let current be the second element of args. Find the first possible format specifier specifier, from the left to the right in target. If specifier is %s, let converted be the result of Call(%String%, undefined, « current »). Otherwise, let converted be the result of Call(%parseInt%, undefined, « current, 10 »). Otherwise, let converted be the result of Call(%parseFloat%, undefined, « current »). If specifier is %o, optionally let converted be current with optimally useful formatting applied. If any of the previous steps set converted, replace specifier in target with converted. Let result be a list containing target together with the elements of args starting from the third onward. If target does not have any format specifiers left, return result. If result’s size is 1, return result. The following is an informative summary of the format specifiers processed by the above algorithm. Implementation-specific representations of printable things such as a stack trace or group. If the options object is passed, and is not undefined or null, implementations may use options to apply implementation-specific formatting to the elements in args. How the implementation prints args is up to the implementation, but implementations should separate the objects by a space or something similar, as that has become a developer expectation. By the time the printer operation is called, all format specifiers will have been taken into account, and any arguments that are meant to be consumed by format specifiers will not be present in args. The implementation’s job is simply to print the List. The output produced by calls to Printer should appear only within the last group on the appropriate group stack if the group stack is not empty, or elsewhere in the console otherwise. If the console is not open when the printer operation is called, implementations should buffer messages to show them in the future up to an implementation-chosen limit (typically on the order of at least 100). Here you can see one implementation chose to make output produced by calls to timeEnd() blue, while leaving info() a more neutral color. Calls to count() might not always print new output, but instead could update previously-output counts. De-duplication of identical output to prevent spam. In this example, the implementation not only batches multiple identical messages, but also provides the number of messages that have been batched together. Extra UI off to the side allowing the user to filter messages by log level severity. Extra UI off to the side indicating the current state of the timer table, group stack, or other internally maintained data. Flashing portions of the console to alert the user of something important. Typically objects will be printed in a format that is suitable for their context. This section describes common ways in which objects are formatted to be most useful in their context. It should be noted that the formatting described in this section is applied to implementation-specific object representations that will eventually be passed into Printer, where the actual side effect of formatting will be seen. The simplest way to implement the printer operation on the Node.js platform is to join the previously formatted arguments separated by a space and write the output to stdout or stderr. Let warning be an implementation-defined string derived from description. Perform Printer("reportWarning", « warning »). The editors would like to thank Boris Zbarsky, Brent S.A. Cowgill, Brian Grinstead, Corey Farwell, Ian Kilpatrick, Jeff Carpenter, Joseph Pecoraro, Justin Woo, Luc Martin, Noah Bass, Paul Irish, Raphaël, and Victor Costan for their contributions to this specification. You are awesome! This standard is written by Terin Stock (terin@terinstock.com), Robert Kowalski (rok@kowalski.gd), and Dominic Farolino (domfarolino@gmail.com) with major help from Domenic Denicola (Google, d@domenic.me).